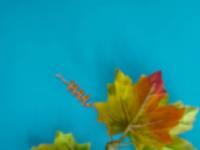 Decorate your walls with a series of colourful trees like this one. 1. Gather your material. You will need brown pipe cleaners, construction paper, green foam, scissors, a hole-punch, an empty toilet paper roll, fabric leaves, and white glue and/or hot glue. 2. 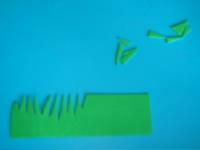 Cut a strip of green foam and show children how they can cut tiny triangles on one edge to represent grass. Help younger children complete this step. 3. 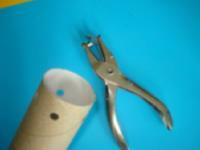 With the hole-punch, make several holes at one end of the toilet paper roll. 4. Cut each pipe cleaner in two. 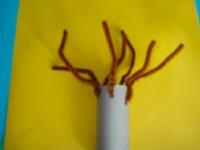 Insert one end of each pipe cleaner piece in a hole and twist it to create a tree branch. Bend and arrange the branches as you wish to form your tree. 5. The fabric leaves I purchased had twisted plastic branches. 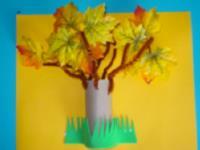 I simply inserted the pipe cleaners in them to add leaves to my tree. 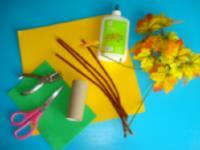 The leaves could also be glued on the tips of the pipe cleaners or, if you prefer, you could wrap the pipe cleaners around the base of the leaves. 6. 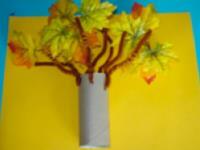 Glue the toilet paper roll/tree trunk on the construction paper. If necessary, glue the leaves in place too. 7. 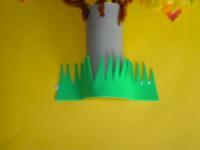 Glue the grass over the bottom of the tree trunk. 8. 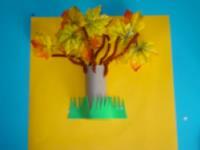 Make one tree or make many to create your own forest or tree nursery!